Even after running seven marathons, I still get butterflies in my stomach the night before a race. Will I wake up on time? Have I chosen the right clothes and fuel for the conditions? These thoughts cross my mind since I know that all the months of preparation are about to be tested the next day. 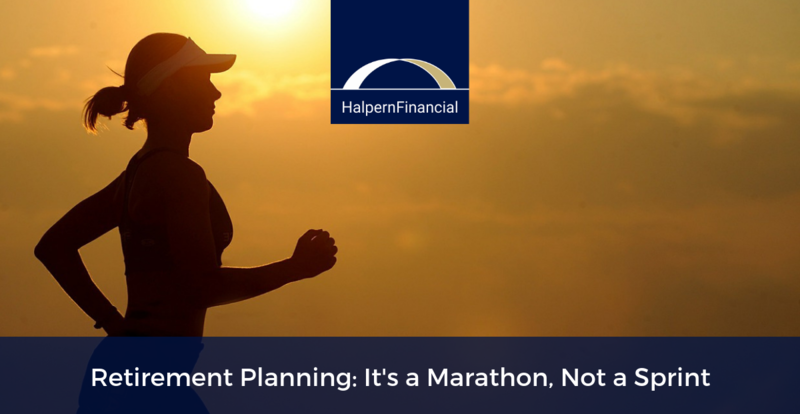 Recently I ran the Marine Corps Marathon in Arlington, VA. As an avid runner and a Certified Financial Planner (TM) professional, I see many parallels between the marathon world and the world of planning for large financial goals like retirement. Both require a strategy and the discipline to stick to that strategy to reach your goal — be it reaching mile 26 or retiring to Florida. When I started training for my most recent race, my goal was to qualify for the Boston Marathon again. I knew this would be a stretch. It had been 18 months since the Boston Marathon, and this summer, I was more of a “social runner” than a “competitive runner.” For runners and savers alike, it pays to have a plan and stick to it. Whether it’s running the first few miles of a marathon or learning how to live on your own as a young adult, establish good habits early so you can hit your stride. Know your pace. Just as runners come to have an innate sense of the difference between a 10-minute mile pace and an eight-minute pace, young adults should develop a sense of how fast they are racing through their available cash. If there’s “too much month left at the end of your money,” there are a number of ways to rein in your spending, whether it’s an Excel budget, or the Halpern Financial Bridge app. This is a good time to develop and stick to a budget. Save in “the bank.” Even if they don’t feel like it during the easy first miles at the beginning of a race, long-distance runners know how important it is to drink water and snack on some Gu or electrolyte jelly beans throughout the race. This is money in the bank, fuel for when you need it most. One of your first financial goals as a young adult should be to strive for an emergency fund of three to six months of core expenses. The idea is to have that buffer there if you need it. “Run the tangent.” In running lingo, this means to stay toward the inside when running around a curve. The distance saved is minimal, but if you do this throughout the race, you could shave off a few seconds or minutes from your time. This is similar to the power of compounding in investing. When you are young, you have time on your side to benefit from incremental gains. So make sure you are investing in your workplace 401(k) account (at least enough to get a matching contribution if your employer offers one) or an IRA. Ideally you should save about 10% of your income, but even if the amount you can invest is small at first, the compounding of that small amount over time can be significant. After the first hour of running, you feel really good. You’ve hit your stride and hopefully you are making progress according to plan. But obstacles may cross your path. Watch for potholes and mind the hills. When I ran the Baltimore marathon 2015, several potholes and hills meant I had to take extra care while running — and be mindful of my time. However, I had trained in all kinds of terrain, so even though it was tough, I felt prepared. Likewise, the investing world may present you with adverse conditions, like market volatility, that are out of your control. When the Boston Marathon qualifying times were released this year, that was exactly how I felt. The times were more competitive than I had been training for—but it was a factor totally out of my control. I had to adjust my expectations given the amount of time left I had to train. Stocks may tumble downward, or surge upward like in the dot-com bubble. You can’t control volatility, but you can prepare your portfolio by having a globally diversified mix of investments that are appropriate for your goals. You can control your investment costs, how much you save and how much risk you are exposed to. If your plan is designed only for the absolute perfect conditions, you may find that it falls short when the going gets tough. Instead, you should be prepared for varied conditions. It’s easier to overcome adversity early on. Early in the race, you are agile in dodging those potholes and attacking the hills, but I know from experience this becomes more difficult later in the race when your body is exhausted. It’s not to say you will be exhausted as you become an older investor, but you may have less of a tolerance for risk once you have more to lose, as well as a shorter time horizon to overcome a loss. This means the earlier you can start saving for retirement, the better. Take a look at your retirement accounts, like a 401(k) and/or IRA, and try to increase your contribution if you’re not maxing it out yet. As you get older, you should be sure to adjust your investments and other elements of your financial plan accordingly. Here is where establishing good habits early on can start paying off — or where you can “bonk” and completely lose momentum. As an experienced runner, I know how to avoid this. Preparation pays off. I know to monitor my speed on the flat ground and up and down hills; and I hydrate and fuel myself so my body can perform well. Similarly, if you have been saving and investing all along, you’ll be in good shape. There’s a lot you may need to do — like keep saving for retirement, financing your child’s college education, paying down a mortgage and plenty else — but you can handle it. Automate your savings to your 401(k) retirement plan, your 529 college savings plan and taxable investment accounts, and keep managing your debt. Stick to your investment plan and stay focused on YOUR economy, not THE economy. Make sure you have the right asset allocation and the most tax-efficient investment strategy, and that you rebalance your investments on a regular basis. These things are all in your control. This is YOUR marathon, not THE marathon. This is the part of the race where you “hit the wall” — your body is on autopilot; you are just moving forward. Everything that you did in training and early in the race will kick in now, just as it would after a lifetime of saving. You do still need a strategy for “finishing the race,” but you are so close to your goal that you can taste it! Cash-flow projections: When you transition from receiving a paycheck to living on retirement income, you should have a plan for your new cash flow, incorporating your required minimum distributions from retirement accounts, Social Security payments and other investment account distributions. Don’t forget about taxes and the likelihood of increased medical costs. Adjusting your savings (if needed): If you are over age 50 and your retirement cash-flow projections don’t look so rosy, you can take advantage of catch-up contributions ($6,000 for 401(k)s in 2018) to your tax-deferred retirement accounts. If you have neglected putting money toward taxable investments, don’t delay — this is also an important pillar of your retirement income. How you will spend your time in retirement: It’s becoming increasingly common to continue to work in some capacity, either for additional income or for the sense of fulfillment and purpose. Of course, there is no set finish line for managing your money. It’s not as if you win “the race” by saving a certain amount within a certain time. But just like managing your money, for the average marathon runner, it’s not about how fast you get there. It’s about whether you feel strong and healthy by the time you reach your goal. My goal this year was to qualify for Boston, and unfortunately, I missed it by just a few minutes. Now I can think of things I should have done differently—but in the end, the goal is to be fit and healthy. And I plan to use everything I learned to train and run again next fall with the same goal in mind. No matter where you are in your “marathon,” avoid comparing yourself to other people. There are runners who get caught up in the energy, excitement and competition during a race, but veteran runners know you have to focus on your own race, not anyone else’s. It can feel discouraging if it seems like others are having more success or achieving certain milestones before you. But that doesn’t matter. All you need to do is understand your own plan and stick to it to reach your individual financial goals. There may be deviations along the way, and that’s OK. You got this! A version of this article first appeared on Nerdwallet.com and Nasdaq. Photo used under public domain.